Minor burn wounds are superficial in depth, small in surface area and uncomplicated in mechanism. They hurt, have good capillary return and should heal within 14 days with good wound management. Burns which heal within 14 days have a low risk of scar formation, although scar formation is multifactorial. Burns wounds are dynamic, they change over time as the wound goes through the stages of healing. Dressings should be reviewed for appropriateness as the wound moves through these stages. 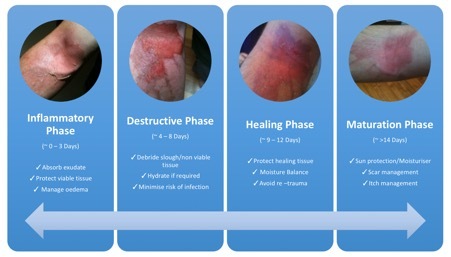 The diagram below provides an overview of the overriding wound management principles as the wound moves beyond the acute phase through the stage of healing.